“Bancassurance” is not a term defined in Insurance laws in India. It broadly refers to sale of Insurance products by Banks (Bank + Insurance= Bancassurance). This was initially introduced in nineties in Europe and later spread to other countries. As Insurance business deals with monies received from policyholders against future promise of claims maturity or settlement, it is highly regulated and Bancassurance is no exception. (i) Straight contractual relation between a Bank & an Insurance co.for the distribution of their products. (iii) An Insurance co. is promoted by a Bank which has an exclusive distribution right to distribute its products. Banks were prohibited to have any relation with Insurance cos. In USA & Canada. Laws were changed in USA in 1999 and Banks are slowly getting into Insurance space though not significantly. The Indian life insurance market has been witnessing a slowdown post certain regulatory changes by IRDA since September 2010. However,the fundamentals for growth remain strong. Over the next decade, India will be one of the fastest growing life insurance markets in the world, with a compound annual growth rate of around 15 to 18 per cent and will account for around 10 per cent of global growth in gross written premiums. It is expected to grow from the fifth to the third largest life insurance market in Asia by 2020. Bancassurance, is defined earlier is the insurance distribution model where insurance products are sold through bank branch network. The presence of several banking groups as promoters of insurance companies is of great significance to this model. With a network of over 80,000 branches spread across the length and breadth of the country, banks have the necessary potential to make bancassurance the most efficient way to achieve financial inclusion in insurance sector also. 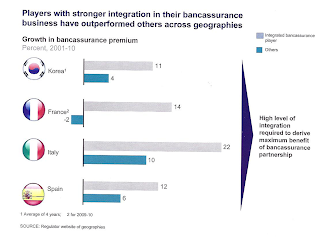 The bank customers with higher average premium per capita provide quicker means to grow for insurers. The complementary nature of insurance products towards the bank advances (e.g. credit life)provide synergies in operations to the entire financial sector. The ease of access to bank customers reduces servicing costs, contributes to lower lapsation of insurance policies and hence lower costs to the economy. a) a Banking Company as defined in Clause (4A) of Section 2 of the Companies Act, 1956.
d) a co-operative society including a co-operative bank,registered under the Co-operative Societies Act, 1912 or under any law for the registration of co-operative societies. So far, the Regulator (IRDA) has granted 3261 corporate agency license out of which 266 have been granted to Banks to act as Corporate agents. While Banks have nearly 100,000 branches in the country, only about 15-20% of these branches have been utilized for distribution of Insurance Products. 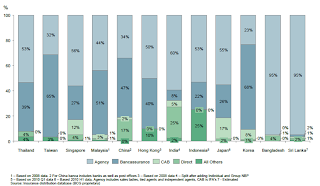 As against an overall 8% in India, Bancassurance accounts for 26% in Japan, 27% in Singapore & 68% in here. Bancassurance accounts for 13% of gross premium in life and 2% in non-life as on 31.03.12 in India (IRDA). While the overall market has stagnated over the last two years (and declined in several product in several pockets), bancassurance has continued to grow (from 19 per cent of new business premium [NBP] in FY 2008 to around 40 per cent in 2012 for private sector players). The share of bancassurance in India for private sector players is now almost as large as some of the other Asian and Western countries (many of which have share of bancassurance close to 50 per cent) and also almost as large as agency channel for private sector players in India (around 45 per cent share of new business premium in FY 12 for private sector players). The role of banks as primary investment counselors is rising. McKinsey proprietary personal financial survey indicates that now 16 per cent of customers choose a bank investment counselor as their primary advisor compared to only 7 per cent in 2007. The importance of Bancassurance thus becomes crucial. Moreover,unlike other Asian markets, bancassurance economics in India is better compared to the overall industry (operating cost and commission is 15-25 per cent lower for bancassurance channel than overall industry). Further, bancassurance is significant contributor to third party fee income for banks (greater than 75 per cent of third party fee income for banks is through life insurance sales). The bancassurance channel therefore has the potential to be a win-win proposition for both banks and insurers. However, there are several gaps in the bancassurance business model in India driven by leakages in end to end value chain that constrain value capture. i. Zonal Division: The States/UTs and major cities in the country have been divided into three zones based on which the guidelines for tie-ups between banks and insurers have been specified. a.Zone A (13 States) - Kerala, Gujarat, Andhra Pradesh excluding Hyderabad, Tamil Nadu excluding Chennai, West Bengal excluding Kolkata, Karnataka excluding Bangalore, Maharashtra excluding Mumbai, Chandigarh, Hyderabad, Bangalore, Chennai, Delhi, Mumbai. c. Zone C(Rest of the country) – Lakshadweep, Dadra & Nagra-haveli, Daman & Diu, Andaman &Nicobar, Mizoram, Arunachal Pradesh, Sikkim, Nagaland, Meghalaya, Manipur, Pondicherry, Tripura, Goa, Jammu & Kashmir, Himachal Pradesh, Uttrakhand, Chattisgargh. No insurers other than the specialized insurer shall tie up with any bancassurance agent in more than nine states/ Union Territories in Zone A (out of 13) and six states/ Union Territories in Zone B (out of 9). There is no such ceiling in Zone C.
No bancassurance agent shall tie up with more than one life, one non-life and standalone health insurance company in any of the states in addition to one each specialized Insurance companies. These are draft guidelines and not yet formal. However, given the fact that the tie-up between an Insurance Company and a Bank, invariably has been on pan-India basis in almost all cases, the proposal of IRDA in restricting operations of such a tie-up on geographical basis (9 out of 13 in Zone A and 6 out of 9 in Zone B ) is causing apprehensions in their mind. The problems in slow take off in bancassurance, apart from being a teething one, are structural in nature and solution lies in sorting out those issues. Some of these issues are in (i) product offering where many partnerships lack basic /priority end to end practices in product development and marketing including availability of simple products, adequate bundles (>3) of core banking and insurance products and joint product development; (ii) Lead generation and sales conversion which has multiple hurdles. For most banks esp Public Sector Banks, the lead generation mechanism depends either on customer walk-ins or the frontline’s relation with the customer who often face capacity constraint. Private sector & foreign Banks generate leads effectively through their outbound sales force, analytics and alternate channels. The sales coversion process also suffers from several pitfalls as only 50-60% of the leads generated are actually converted. (iii) then there are several leakages in the Bancassurance channel post the log-in as much as 30% between log-in and policy issuance, the main cause being frontline’s inability to collect all relevant documents. (iv) there also are leakages, post sales service and persistency management. To conclude,creating a focused program with close involvement of both Banks and Insurers can help make the model a win-win for both and capture full value from the partnership. ps.I have taken inputs from the later report of Mckinsey & co, Financial Institutions Group on "Capturing the full value of bancassurance through end to end integration"
I am not able to understand the logic for different guidelines ? The restrictions imposed..are they a natural requirement or artificial restriction ? Most often, banks cajole their customers into taking insurance, though they might be unwilling. Is it a good idea to allow the mixing of the two, esp as insurance decisions, in many many cases, might be taken for non-insurance reasons.